For a beautifully modern take on your classic pâtisserie favourites, head to La Pâtisserie des Rêves (Pâtisserie of Dreams), like right now. Seriously, I'm not kidding. Even if you aren't hungry just head there to have a look at their displays, you will quickly change your mind I can assure you. I love wandering through their stores just to admire Philippe Conticini's beautiful creations in those big glass cloche-like things. 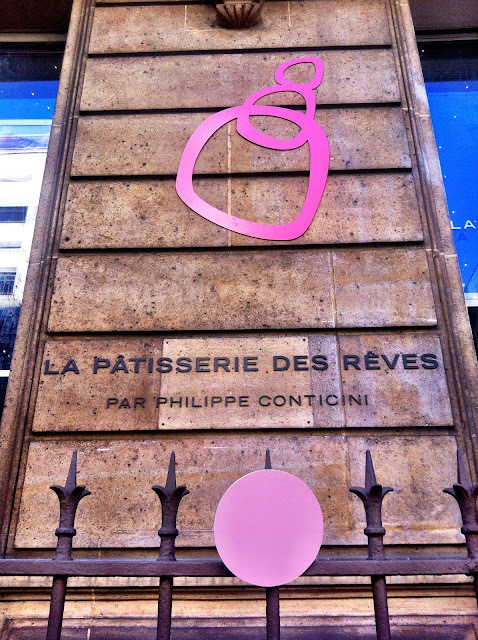 While it doesn't have the warm, traditional feel of your typical around-the-corner French pâtisserie, La Pâtisserie des Rêves does not fail in seducing your senses, albeit in a rather unconventional way - minimalist clean lines, modern playfully pink decor and a surprising almost laboratory-like feel. 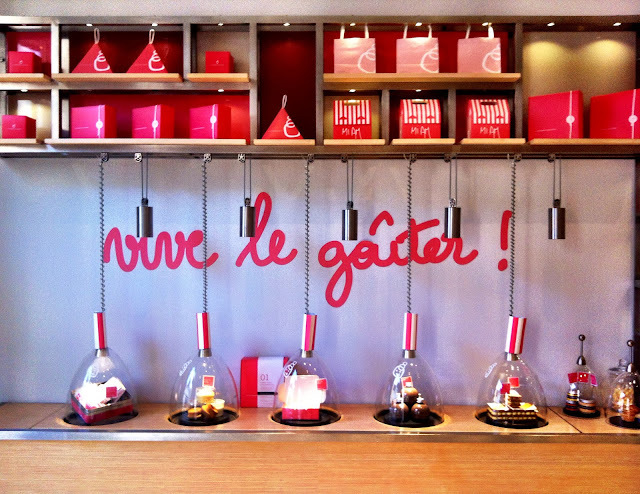 Along the walls are some mini snacks under more glass cloche things - "long live snacks!" 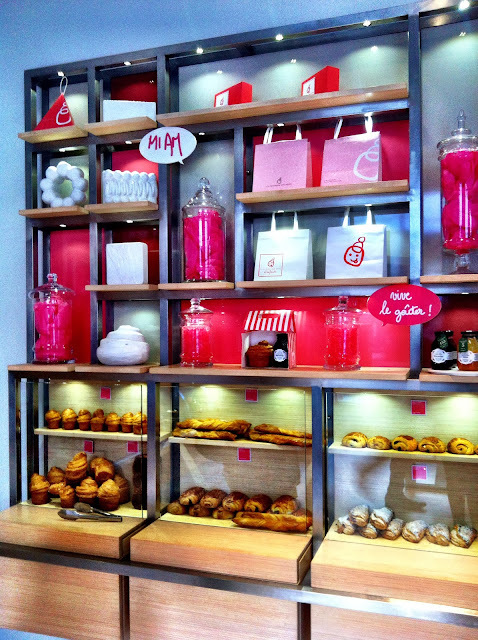 As well as your traditional boulangerie favourites: croissants, pain au chocolats, brioches etc.. 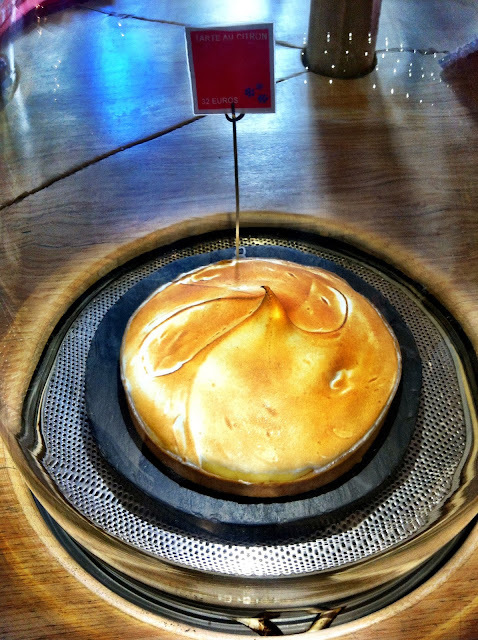 But it's the centre table that catches my eye - firstly, the show stopping tarte au citron (lemon tart) which is like a work of art. Ooh, look how it swirls...! 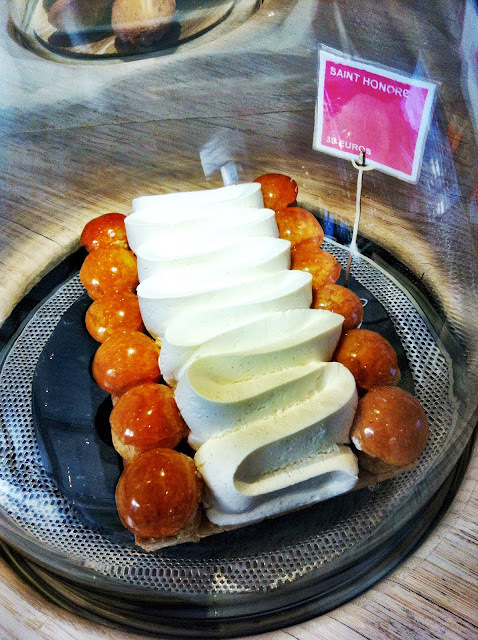 Next, their famous Saint Honoré revisited, I have never seen a Saint Honoré presented like this before as they are normally circular in presentation. I cannot wait to sink my teeth into this one. Even those lashings of cream don't scare me..! 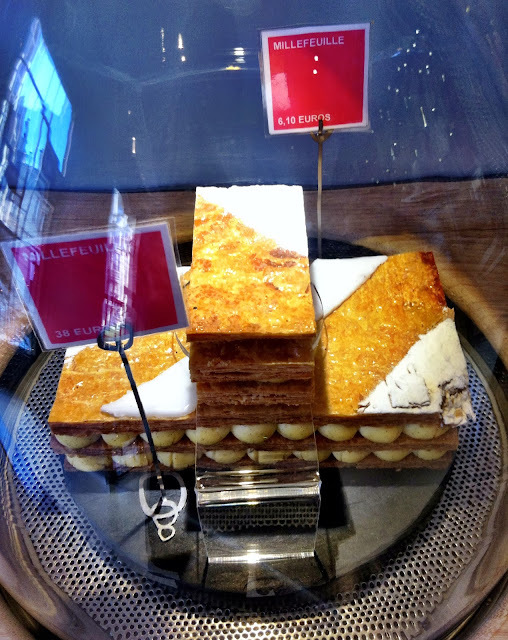 Then, there's their classic millefeuille revisited also. 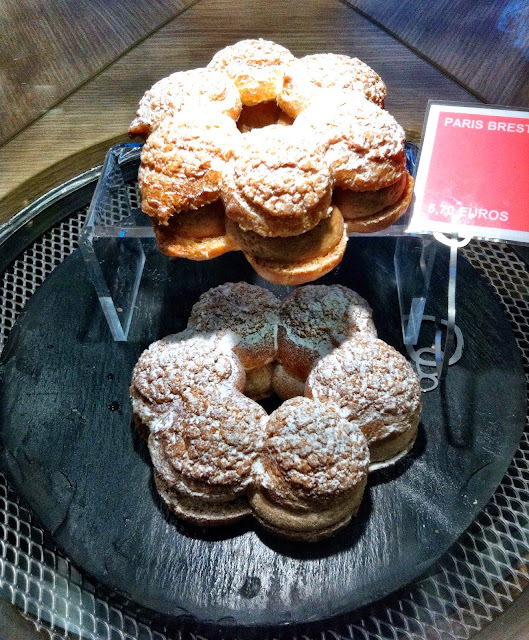 Their famous award winning Paris Brest. And lastly the tarte of the month which is a blueberry and almond tart. The type of tart changes each time I drop by their stores for some window shopping. 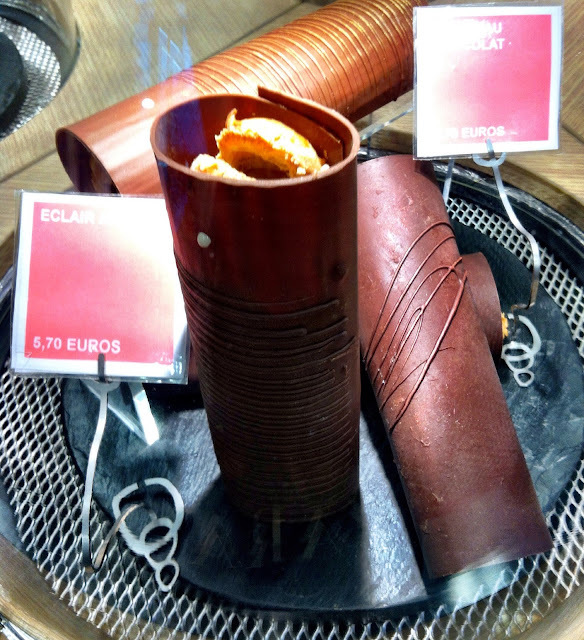 Ooh and how can we forget Philippe Conticini's eclairs revisited. Encased in a cylindrical chocolate shell - these eclairs are filled with rich praline chocolate that oozes out of the light choux pastry with every bite. YUM. 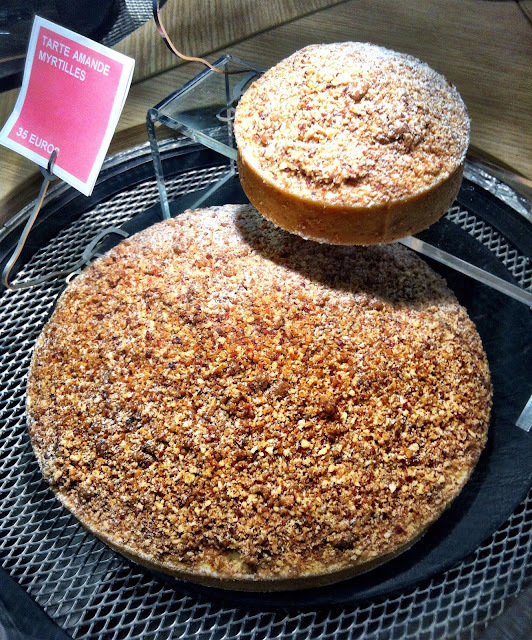 So, after much careful consideration, my girlfriend and I decided on two of La Pâtisserie des Rêves signature creations to try: the award winning Paris Brest and the mouth-watering Saint Honoré (to share of course!). The original Paris-Brest was created in 1891 to commemorate the bicycle race from Paris to Brest and is normally in a ring structure to resemble a wheel. 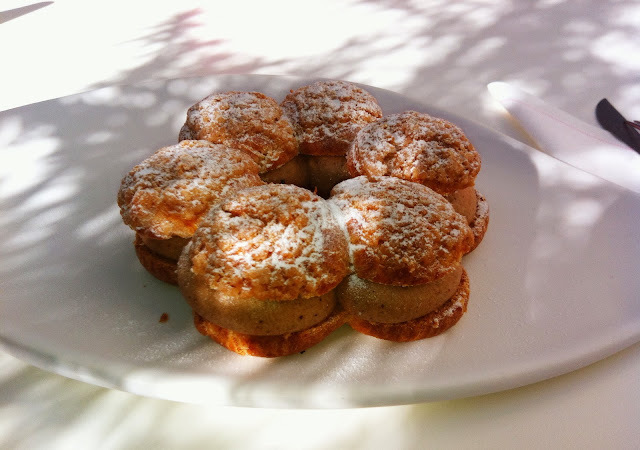 Philippe Conticini's version is easier to share and comes with a deliciously surprising burst of liquid praline with every bite, inside each bauble of praline cream - no wonder it was awarded the best Paris Brest in 2010 by Le Figaro! 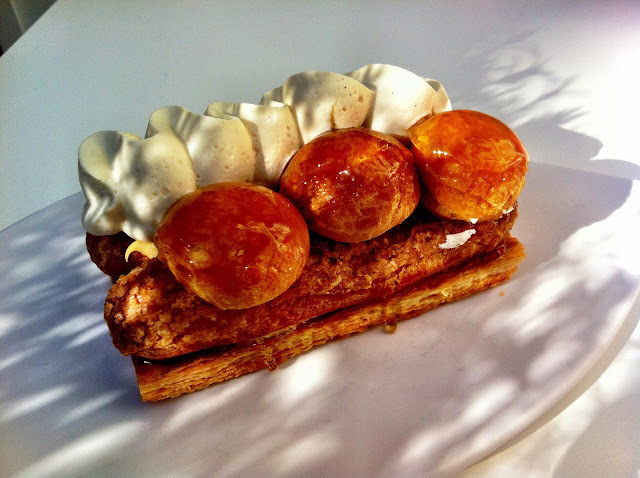 The Saint Honoré is normally a round cake with the puff pastry at the bottom, then the caramelised cream puff balls arranged on the circular base topped off with cream. It is fairly complex as you have 5 components, the puff pastry, the cream puffs, the pastry cream, the caramel and then the Chantilly cream. I am definitely NOT a cream person but I managed to finish off ALL the cream speckled with delicious tiny vanilla pod seeds. The cream is not too rich on your palate and works incredibly well with the crunch of the caramel coating and the delicate flaky texture of the pastry. In one bite, you have caramelised crunch, delicate flakes of pastry and vanilla cream - it's a feast for the senses, seriously what more could you want..? And then before we knew it, it was all over. A beautifully sunny afternoon spent at La Pâtisserie des Rêves in the outdoor part of their tea salon. My girlfriend and I (whom I had not seen in 15 years but was now also coincidentally based in Paris!) gas-bagged away, spoons in hand sharing our two amazing desserts. Can't wait to head back and do it again. For more information, here is the link to their official site - enjoy! Hey Nhan! 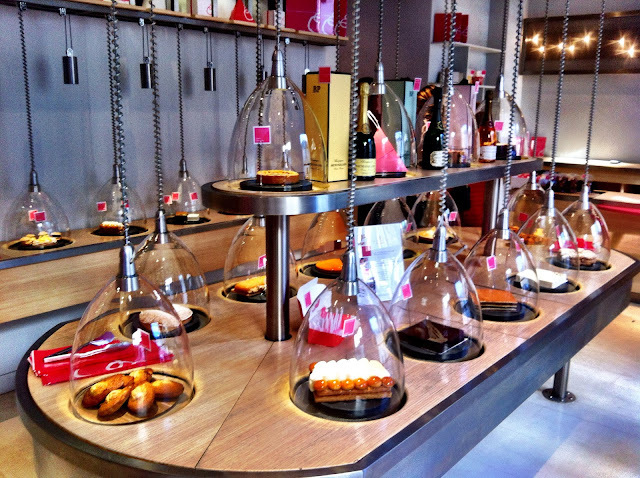 Have you have a chance to try all of the cakes? They are so attractive..so yumyum. I wish I could have a pair of wings to fly to Paris to try of the beautiful cakes in your post=) Thank you for open our eyes!! Oh man these all look so good! were they expensive? French definitely know how to make moth-watering desserts. I came across your blog on expat-blog.com. Currently I live in Bangkok but secretly I have a French heart.